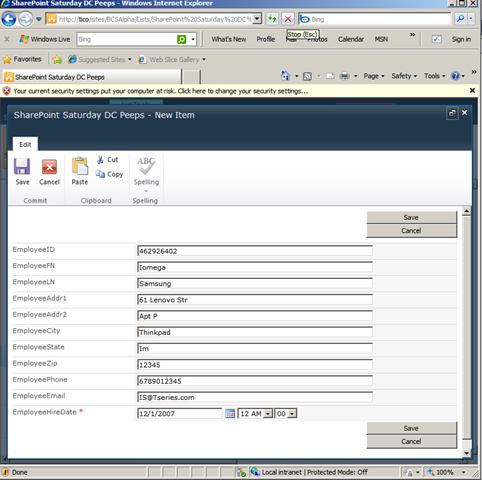 First, this lab builds on an article I saw on MSDN regarding SharePoint 2010 External Content Type which discussed how to create an External List using Business Data. I noticed that they showed methods for the code but showed no foundation or a Use Case, nor did it discuss the LOB System and how the class entity relationship is defined. Check out your Database and pay special to the Columns which will be your fields in your Class Definition, also document your data types. Above: First we need to have our database ready. Above we can infer that we will be going against a server called “Tico”, a Database called “FabianPlayPen” and a Table called “Employee” please take time to notice the current data records currently in there. 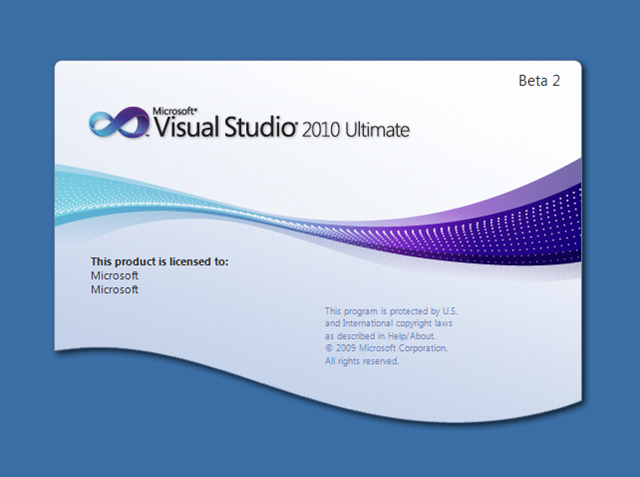 Once you are done, crack open your Visual Studio 2010 Beta 2. 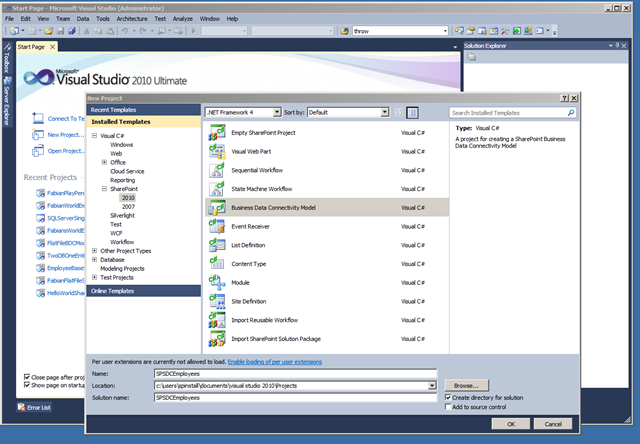 Note: To work with the Beta 2 bits of SharePoint 2010 you MUST use Visual Studio 2010 Beta 2 for the Templates to work. Above: Create a new Project of type “Business Data Connectivity Model” the guy you need for BCS. 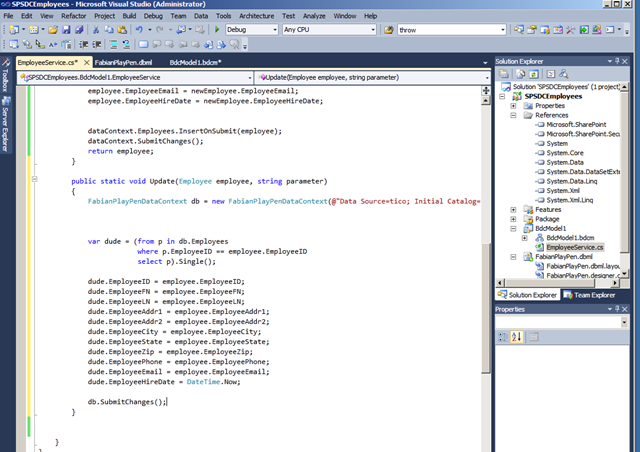 I have my VS 2010 set for C# only but you can do this with VB.NET also. I have named my Project “SPSDCEmployees”; this is important because I will be using this name in conjunction with the Entity Class to be created later on in this demo/lab. 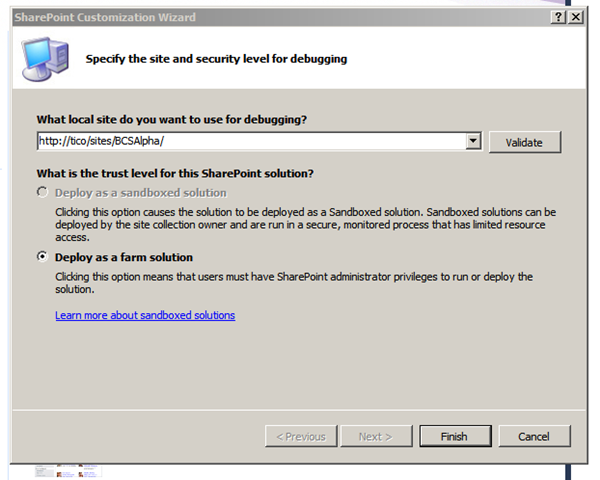 Above: Once you have selected and named your Project you are prompted to choose the site for debugging. I have already created a site called “http://tico/sites/BCSAlpha” for this venture and i have so identified it in my dialog box. Above: Once you click on Add Connection you will be presented with the dialog box above, please indicate your Server Name and the Database you are interested in. In my example my Server is my doggie’s name “Tico” and the Database is called “FabianPlayPen” very apropos wouldn’t you say? Above: By default and design, when you create a BCS Project an Entity called “Entity1” will be created, shortly we will remove that entity because as part of that process two classes are also created which we will subsequently delete. Reason being, there is a lot of code already inplace that we will need tie into, by deleting the Entity Object and the related Classes and subsequently recreating our own, we have better control over our build process. 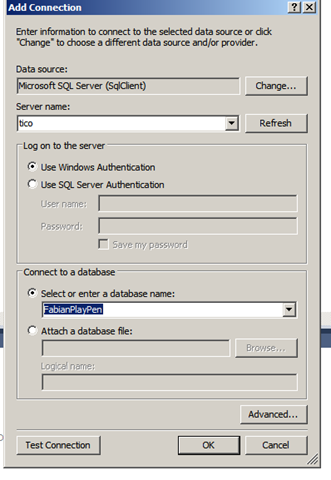 In our example we named our New Item “FabianPlayPen” and a file called FabianPlayPen.dbml is crated in our solution. 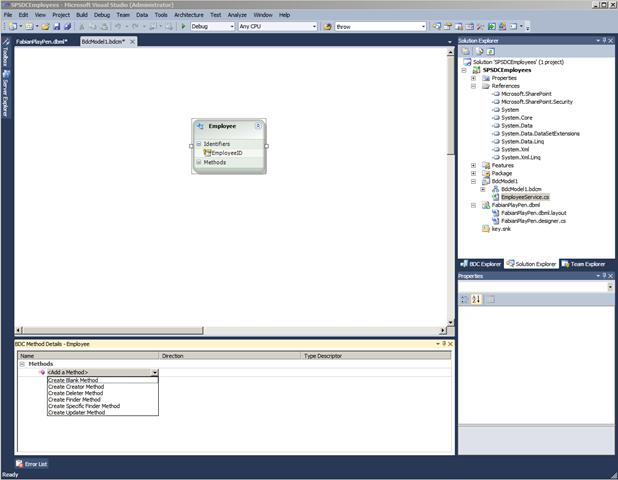 Above: The blank design window is what you are initially presented with and is the framework where we will model our Entity Class. On the View menu, click Server Explorer. 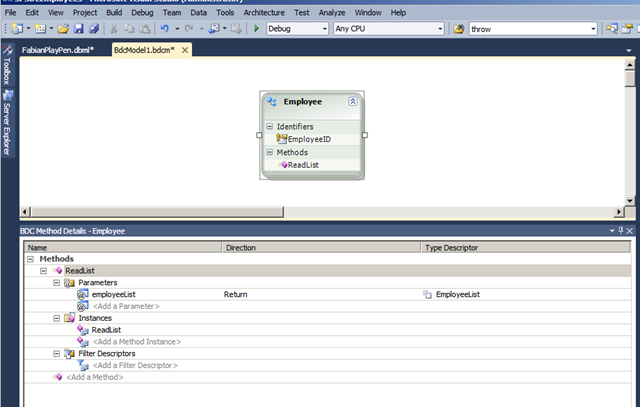 In Server Explorer, expand the node that represents the Employee database, and then expand the Tables node. Drag the Employee table onto the O/R Designer. Above: The newly created entity is now present in the OR designer nomenclature is the name of the table in the LOB System. An entity class is created and appears on the design surface. The entity class has properties that map to the columns in the Employee table. Now that that process is complete, we need to do some clean-up to aid our design process. 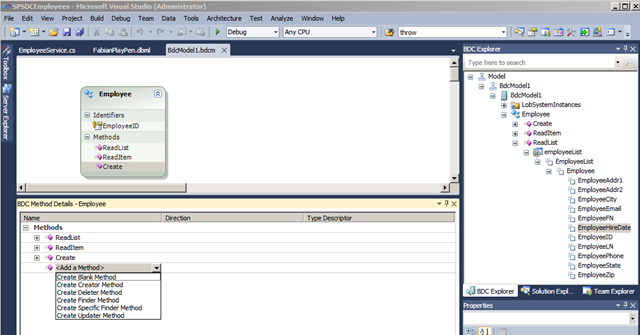 Above: In Solution Explorer we dobule click on BdcModel1.bdcm and we get the desing pane above. 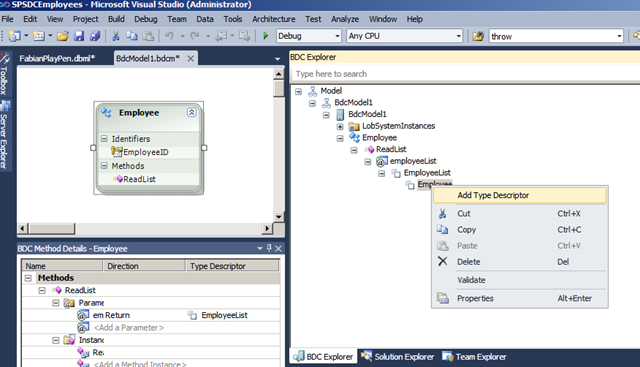 In Solution Explorer, expand the BdcModel1 node, and then double-click the BdcModel1.bdcm file. 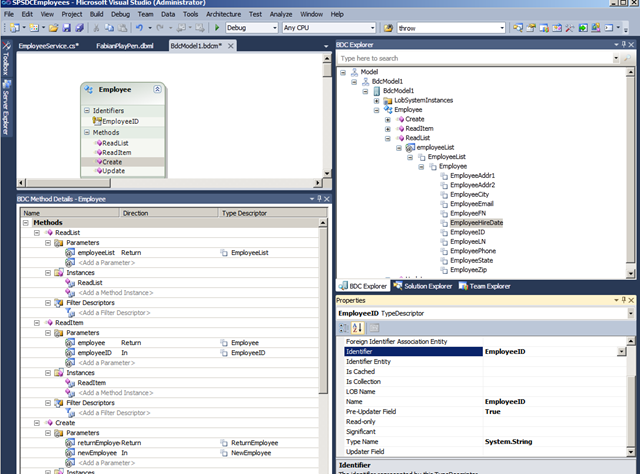 The Business Data Connectivity model file opens in the BDC designer. In the designer, right-click Entity1, and then click Delete. 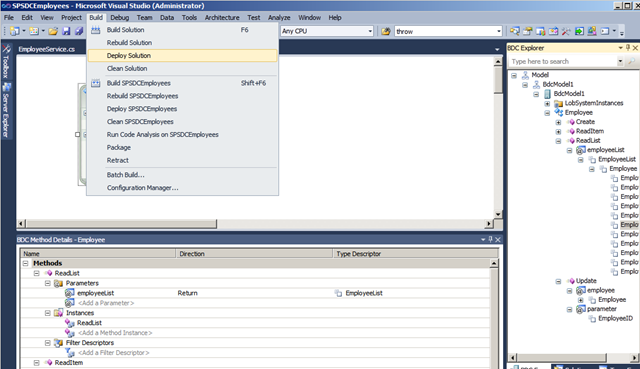 In Solution Explorer, right-click Entity1.cs, and then click Delete. Right-click Entity1Service.cs, and then click Delete. Above and Below: The process to delete the associated .cs files. Above: We will now create our new entity which will abstract our Employee LOB System table from our FabianPlayPen database. 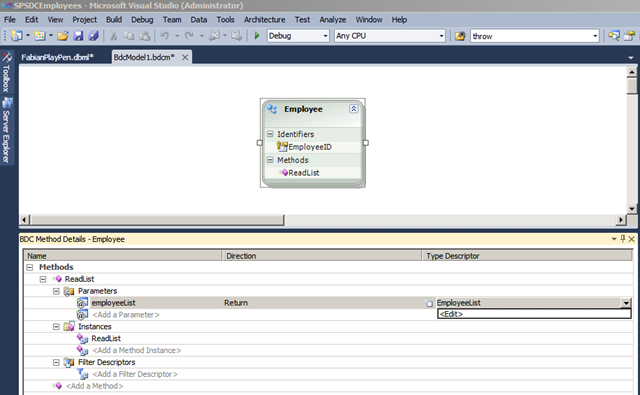 From the BusinessDataConnectivity tab of the Toolbox, drag an Entity onto the BDC designer. 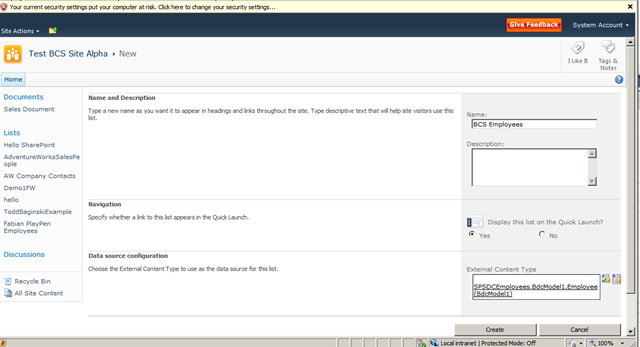 On the View menu, click Properties Window. On the designer, right-click the entity, click Add, and then click Identifier. A new identifier appears on the entity. Below is a representation of our work so far, it includes the newly created Entity and our Identifier. Next we will create our Methods to Create, Read, Update and Delete. 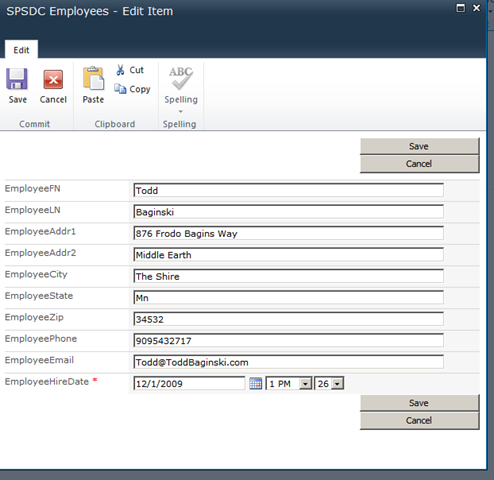 On the BDC designer, select the Employee entity. 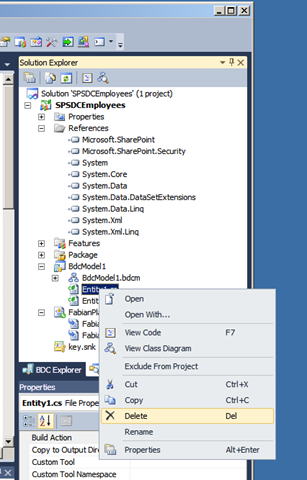 On the View menu, click Other Windows, and then click BDC Method Details. 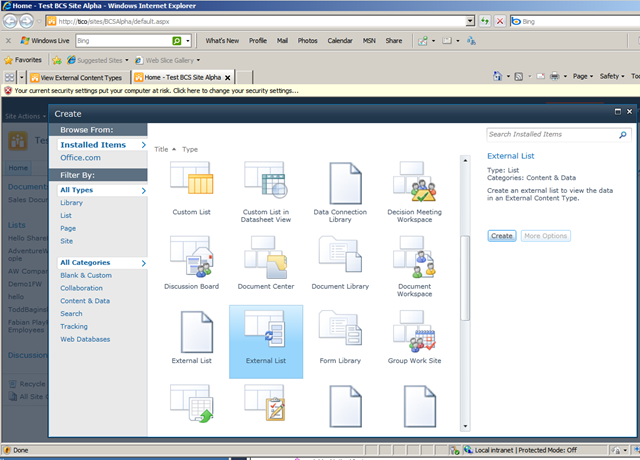 In the BDC Method Details window, from the Add a Method drop-down list, select Create Finder Method. 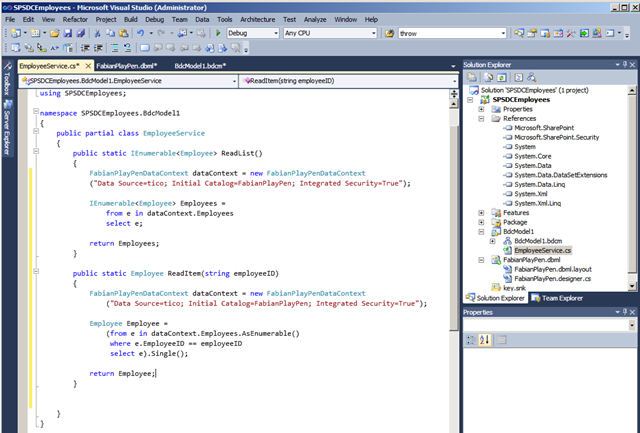 Visual Studio adds a method, a return parameter, and a type descriptor. The BDC Explorer opens. 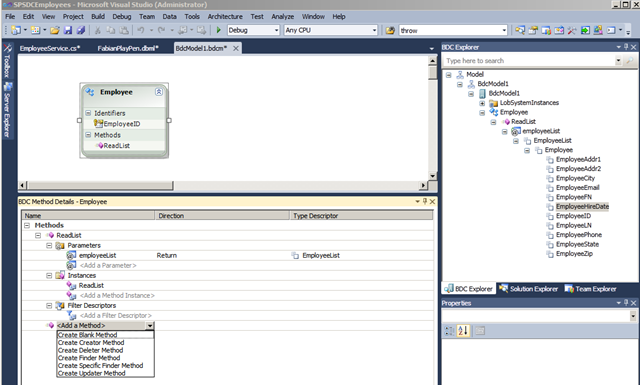 The BDC Explorer provides a hierarchical view of the model. 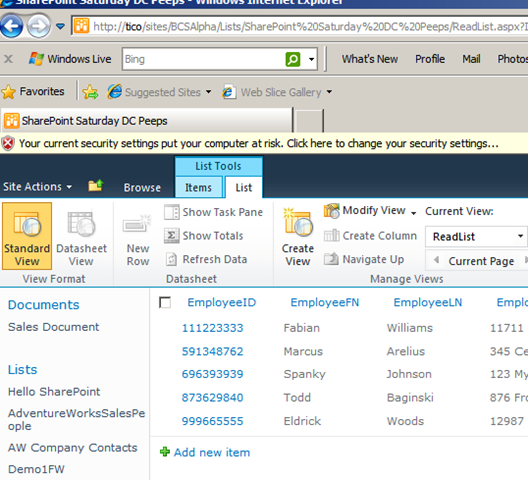 In the BDC Explorer, expand the EmployeeList node and select the Contact node. 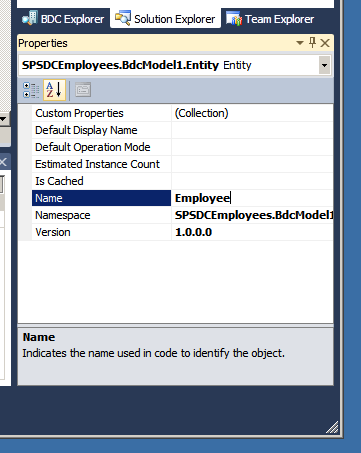 In the Properties window, set the Type Name property to SPSDCEmployees.Employee, BdcModel1. 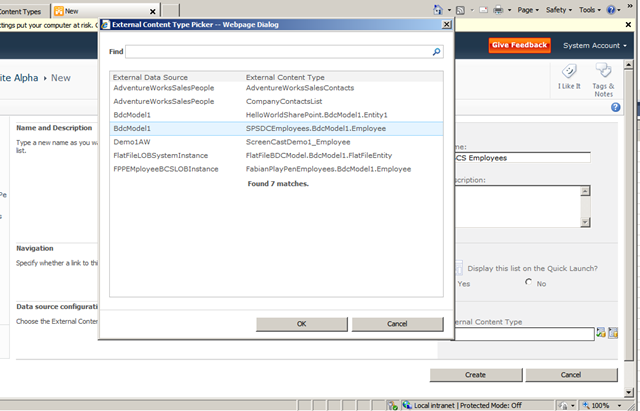 In the BDC Explorer, right-click the Employee, and then click Add Type Descriptor. 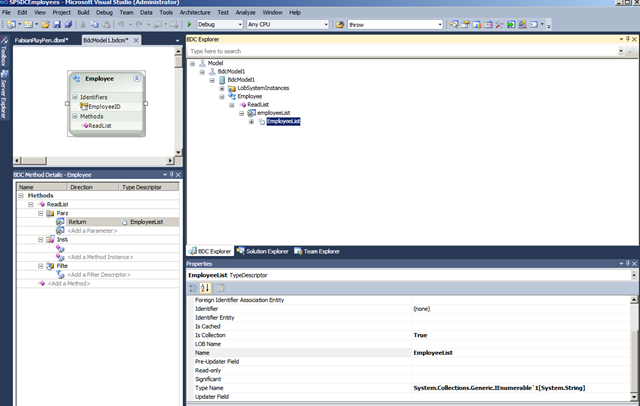 A new type descriptor named TypeDescriptor1 appears in the BDC Explorer. 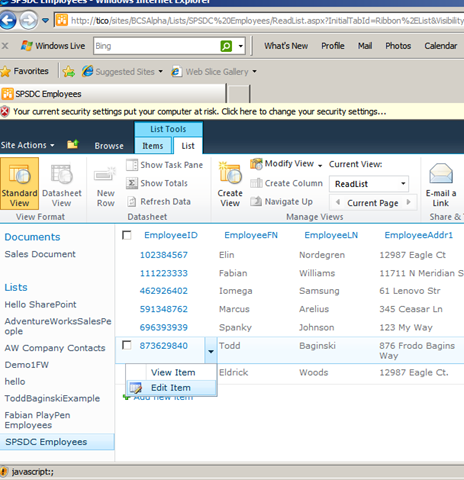 In the Properties window, set the Name property to EmployeeID. Set the Type Name property to System.Int32. From the Identifier drop-down list, select ContactID. 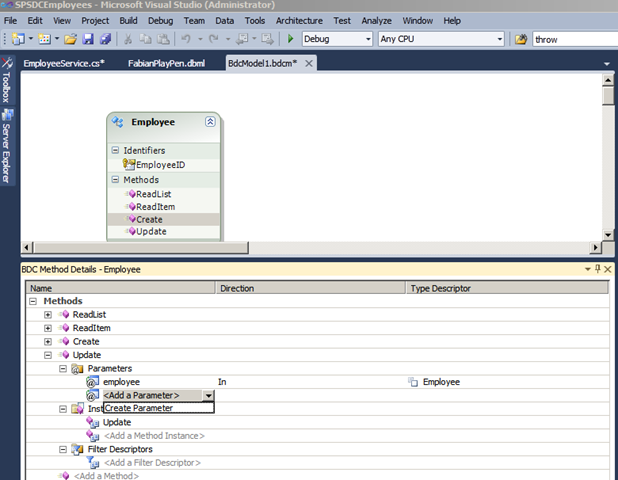 Repeat step 8 to create a type descriptor for each of the following fieldsAs seen in the below 3 ScreenShots. 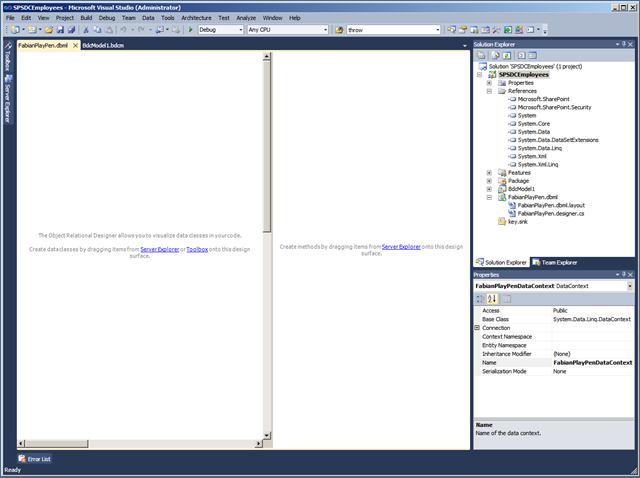 Above: Double-Click on the ReadList in the Employee Entity to enter the code view as seen below. 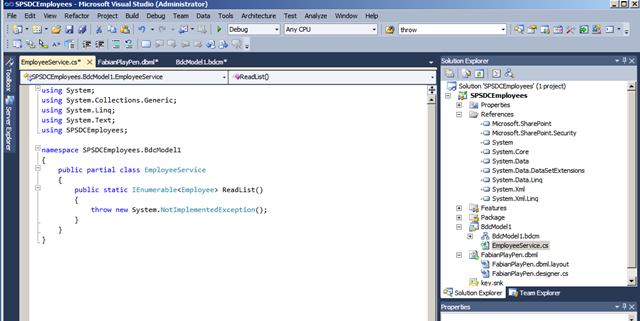 By default a method is created and we need to remove the entry in the method and replace with our own. That it. Easy isnt it! Next we need to create a Specific Finder Method which is responsible for returning a single item as requested in the SharePoint UX. As before we go back to the BCS Designer to add the Method and add our code… see below next three screen shots. 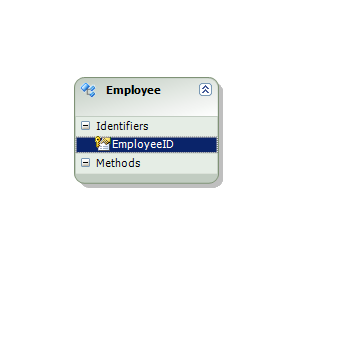 In the BDC designer, select the Employee entity. 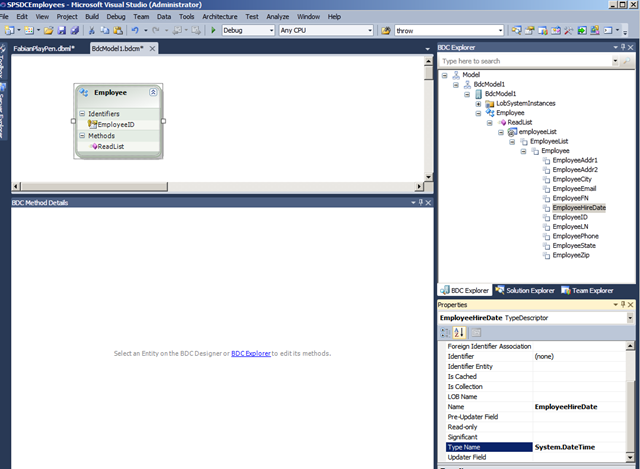 In the BDC Method Details window, collapse the ReadList node. From the Add a Method drop-down list that appears below the ReadList method, select Create Specific Finder Method. 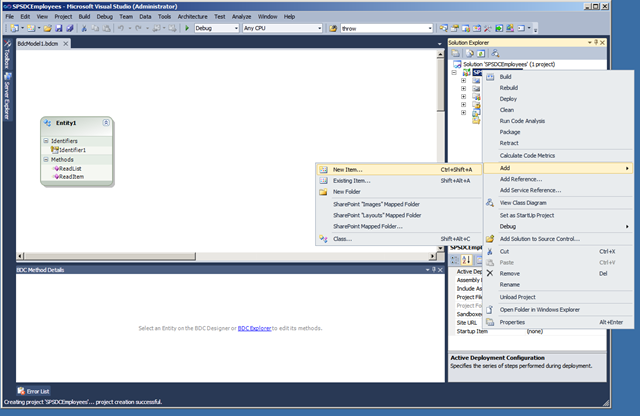 Visual Studio adds the following elements to the model. 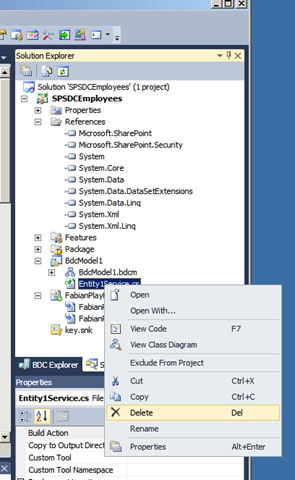 These elements appear in the BDC Method Details window. An input parameter for the method. A return parameter for the method. A type descriptor for each parameter. A method instance for the method. In the BDC designer, on the Employee entity, double-click the Readitem method and add the code you see in the second (2nd) screen shot. We will create two additional method Create and Update.. lets go with Create first then the Update Method. 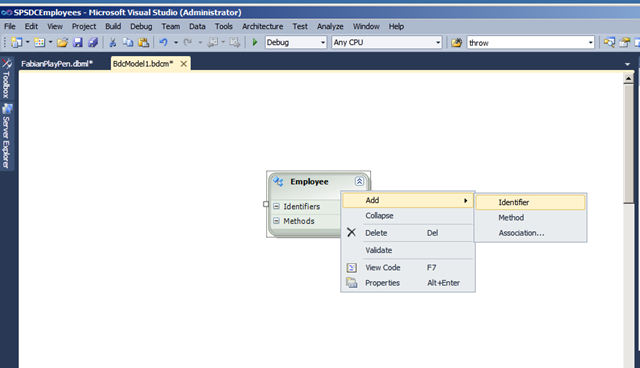 As before we begin from the Entity and select new method from the BDC Method Details Pane. Click the Method and add the code as reflected the screen shot. Finally we get to deploy our solution and see it in action. Click build then Deploy Solution to get our code up to our Farm. Above: Evidenced that our External Content Type is on the Server Farm, we now move to creating our External List to surface the information abstracted by the External Content Type. Above: Under Site Actions, click Create More, then choose External List. Above: So… Viola! 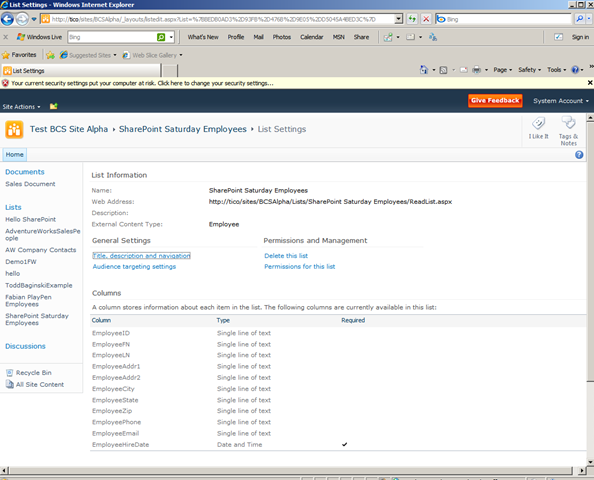 we have our external content type representative of the SQL Database Table called Employee, neat huh! Above: as part of our verification process we have confirmation that our columns are consistent to the Entity and LOB System. Now lets kick the tires on the newly created methods.. Above: Lets click “Add New Item” this will instantiate and fire off the Create Method of our External Content Type. The next four screen shots represent the new form, the entered values, the post and final resultant Read List with the created item. You can do this same work using Designer. Not sure why you used Visual Studio? I haven’t met one person that cares how to create a BDC model. I think it’s cool but I’m a geek. Well, this is just part 1 of a series, i have been blogging and tweeting about making relationships between disparate LOB systems i.e. 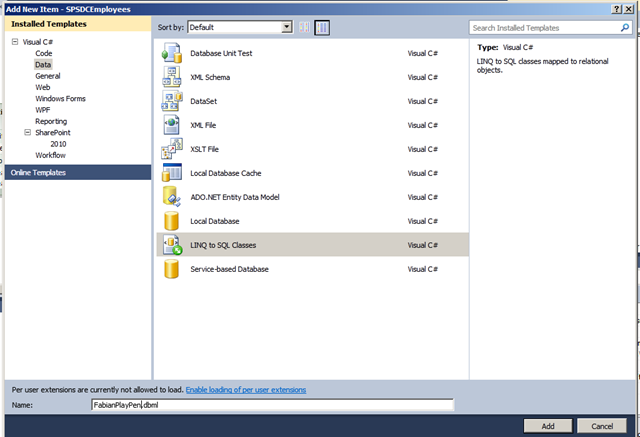 Flat File and SQL, Web Service and SQL, and that story is easier well, lets say it is more extinsible in VS rather than SPD. 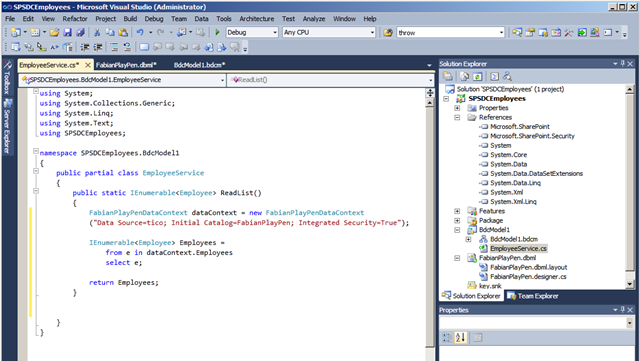 also to more accurately answer your question, it allows for a proper SDLC if designed here and extended in SPD 2010 under the same WSP/ dll. Maybe you can do it with the designer but can you create a deplyable solution with the designer? Great work posting about BCS on your blog! I have been trying to figure out how columns must be required. In your example I see that only EmployeeHireDate is required. How would you make this field required, and have a friendly message if not filled in? 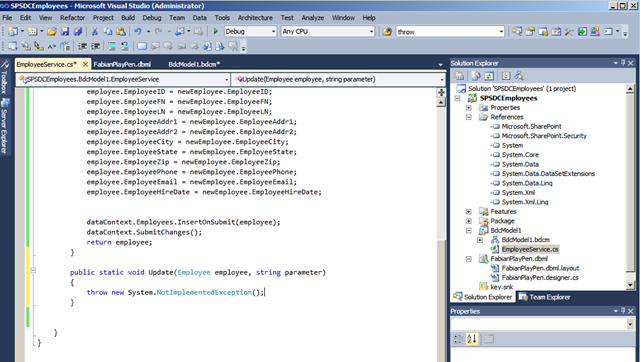 I have seen one example with adding “RequiredInForms” in the TypeDescriptor, creating the model from SPD, but it is not working from VS. Any ideas? I will do as much in my next Blog, it is handled in the TypeDescriptor in the Properties Editor. I think it is Great! I cant find enough time in the day to explore it. Thanks for joining! And thanks for the great articles, keep up the fantastic posts! Great articles,let me have more concepts about the BDC. so far so good. any update on the retrieving data on a per user (logged in) basis? Where is the source code for your example? Forgive me a link to a zip file of the code is somewhere on this rather busy page, but I cannot seem to find it. I am getting an error while creating new record via BCS. What is your email id? Once you give it to me then I will send you the screen shot. but you are right I am getting datatype error. Failed to get value of “ID” column from the “Integer” field type control. See details in log. Exception Message: This field cannot be updated.. I have the same issue. It seems that external lists have diffuculties with identifiers from BCS with the name ‘ID’. Changing the name of the identifier in the model will solve the problem. What’s about the paging function? Can we implement BCS with paging. 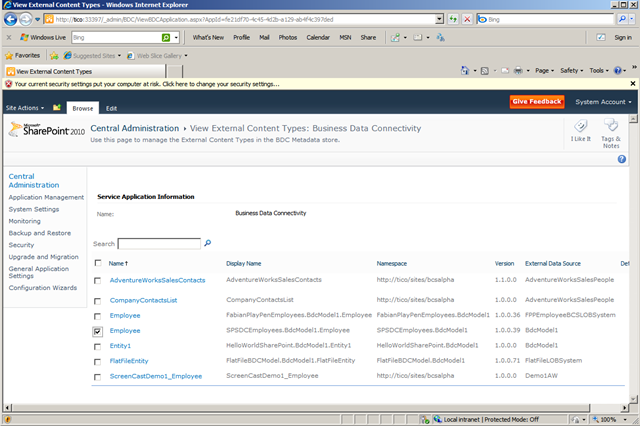 So what BCS gives you is External Content Type and External List as a high level artificat to work with. In List view for the external list you will have paging built in. If you want to take an external content type to create a Web Part to consume the data withing then Paging is your responsibility. Now that said, i think alot can be done with Silverlight and using the paging features inherent to Silverlight may be easier to do. Hope this helps. Hi, nice post, Can some tell me how to data related from two table like products(product related columns & Customer Id) and customer(customer related columns with customerId), in the DB these two has relations, then how to maintain relations in model design. And explain if possible, in bcs design what is Foreign Identifier Association Entity and other detials like association betwen two entities.. 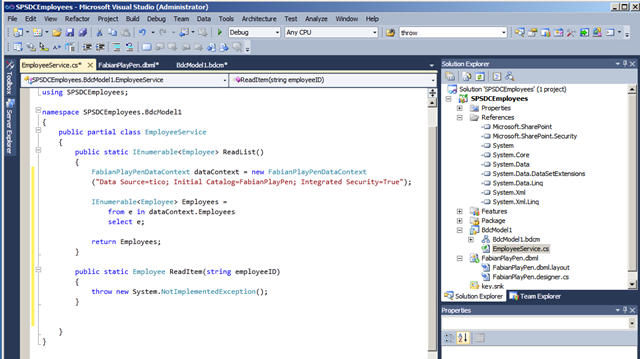 So, the answer to that is that it must be done in Visual Studio using the BCM Model. 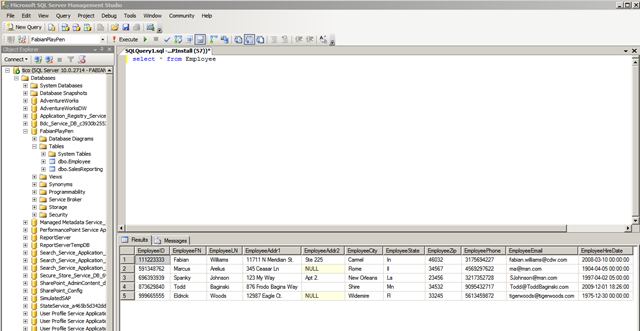 I have sucessfully done it with LINQ to SQL and creating an associated class representitive of a JOIN between the tables. Then use that Aggregated class as my Entity. 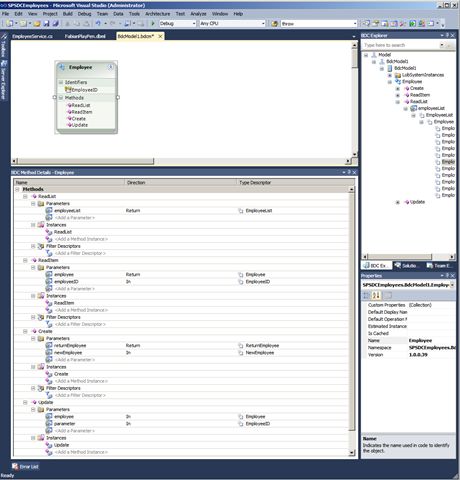 All the joins and database magic happens in the LINQ to SQL class. Really like your posts! I tried this solution out using the Department table of the AdventureWorks database, but I have problems viewing the external list (got that “Unable to display this Web Part” error). I debugged the LINQ code and the ReadList method retrieves the departments, but it seems the error occurs after executing the return. No errors in the LOGS nor Event Log. Is it possible I forgot to set a permission somewhere? so, the most simpliest reason for that error is returning too much records at once. do a filter and see if it fixes the issue. if not send me ur code.. I too have the same issue as Karine (issue #14). I do not see any errors in the logs or the event logs either. Am I missing a setting? I have checked on the SQL backend and the SQL query has run correctly. My External List breaks after the fact with the dreaded “Unable to display this webpart” error. This is very frustrating. Your example code is excellent. Any help would be truly appreciated. Like you said I have created all,i have issue when we add “Add New Item” .. 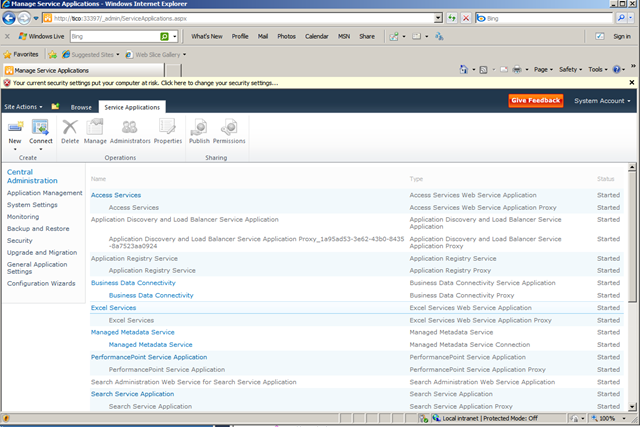 I am consuming service from SAP about employee information. I have created the entity in BDC, its a external contain type. 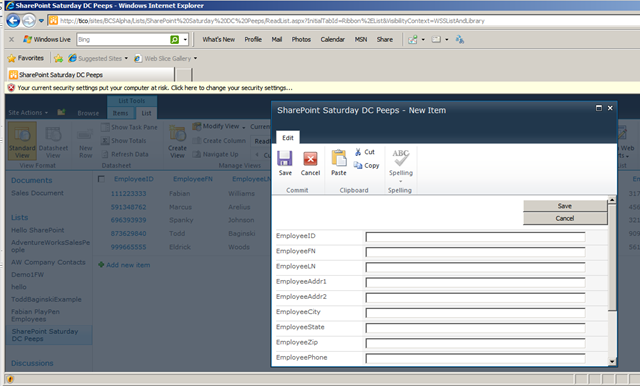 I have created CRUD method for Employee, but while creating a new item in share point screen , I am getting the text boxes to save employee details but i need to flush (or pre-populate) few information such as empid, name,competency and have to make it readonly, and also for category i need to give a drop down box, and and also i have no of experiance NoOfExp identifier in Employee Entity how can provide drop down for this? atleast hardcoded values. The Model OOB creates Text Boxes, I have not done what you are asking but it is worth a try. I will take a stab at it. i have created a external list with below code. Everything works, but when I try to update an item, I get this error (shown below). The item is updated successfully, which is odd. I’ve searched the forums for this error, and found nothing. error:”The instance cannot be updated, because there have been changes to the original instance data. Surprisinlgy I have seen that before too and I think it has to do with the event postback refresh. It happens to me in SPD 2010 ETC when I link to Outlook and try to update in Outlook client. I havent seen anything on it and it happens only sporadically. not all the times. while debugging it the control not comes to update method only.. i had put break points every where..
readitem method called 3 times and the record is updated. I get the below error when i try to deploy, please help. Error	1	Error occurred in deployment step ‘Add Solution’: The HTTP service located at https://localhost:32844/SecurityTokenServiceApplication/securitytoken.svc is too busy. not sure mate, check the ULS log for some additional info..
Hi Mr. Williams, I’m hoping you can help me. Information regarding my environment: I’m trying to connect a MySQL database to SharePoint using BCS. windows server 2008 R2 standard. I figured I could use your guide and just change the some of your code (the code specific to SQL) to allow queries/inserts to the aforementioned MySQL Database. 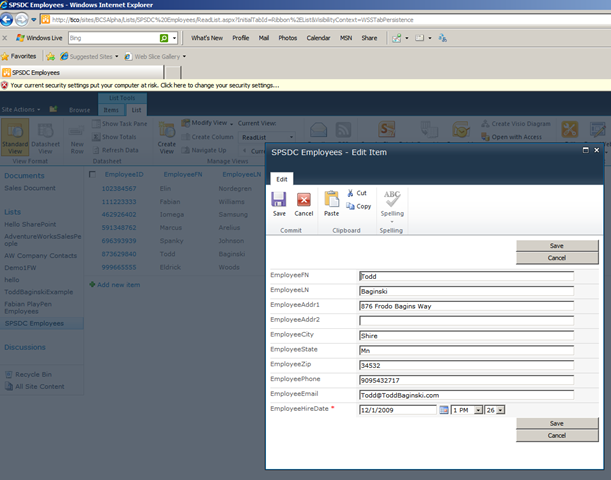 What’s odd to me is that the NewForm form appears straight after deployment but when I open a new form it shows up blank as in there is no fields present whatsoever. 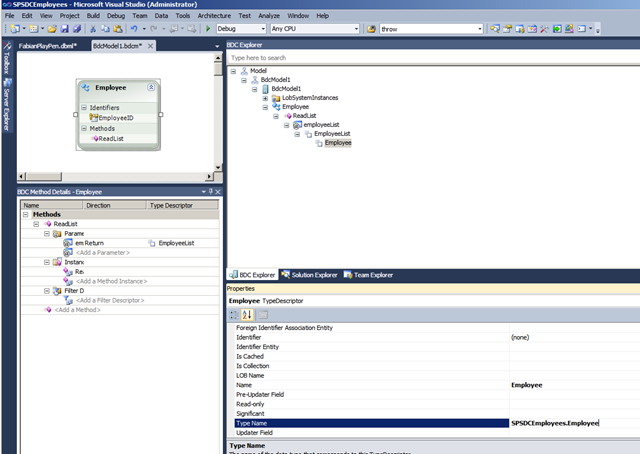 Then when I try to configure the Create Operation in the External Content Types option from my Document “external content type” and make it so that it matches the input and return parameters and save the Content Type, it says that “creating is not supported” and upon creating a new External List, I find that the NewForm.aspx has disappeared. I’ve done much research and check input parameters and return parameters and code and the insert string to no avail. Could it possibly be because I have the project on the .NET 4.0 Framework? and sharepoint is on 3.5? because I’ve just recently noticed that the aforementioned “blank form” has “incompatibilities” I haven’t had much time to investigate since I stumbled upon your blog and I’m not too good with xhtml/aspx. But if I solve the problem then cool but I probably will have difficulty so I beseech you to assist me! Thanks Colin I appreciate the feedback, I am blogging on my 2010 Site now also http://www.sharepointfabian.com/blog check me out there. Microsoft.BusinessData.MetadataModel.InvalidMetadataObjectException: Cannot find Property with name ‘SupplierID’ on the parent object. The parent object may be returned by the LobSystem (External System) or it is created to be sent to LobSystem as input. This Property is referred to by child TypeDescriptor with Name ‘SupplierID’ and Id ‘1358’ on Parameter with Name ‘supplierList’ on Method with Name ‘ReadList’ on Entity (External Content Type) with Name ‘Supplier’ in Namespace ‘MVBdcModelProject.BdcModel1’. I have created a input param for ReadItem and created Filter Descriptor. similarities has confused me. For instance, “Employee” may be referring to the FabianPlayPenDataContenxt.Employee entity, or the BDCModel1.Employee, or the BDCModel1.employeeList.Employee. Could you rework the ReadList() using explicit types? Nice work and beautiful community participation, as well. It is always good to see someone learn so deeply and turn-around and freely share with all. I realize this is an old post but hopefully you’re still looking at these. I’m facing a problem connecting to a Oracle Database. I can pull data from the db on this machine first off. However, when I put the connection into a BDC model, it gives a error. Error while executing web part: Microsoft.BusinessData.MetadataModel.InvalidMetadataObjectException: Cannot find Property with name 'FIRST_NAME' on the parent object. 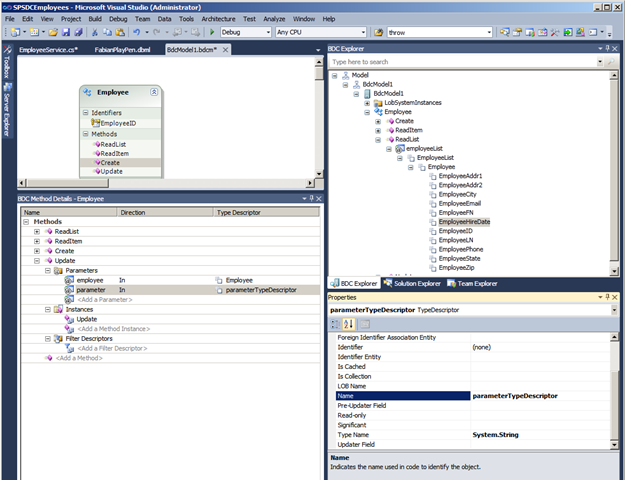 The parent object may be returned by the LobSystem (External System) or it is created to be sent to LobSystem as input. This Property is referred to by child TypeDescriptor with Name 'First_Name' and Id '443' on Parameter with Name 'employeesList' on Method with Name 'ReadList' on Entity (External Content Type) with Name 'Employees' in Namespace 'OracleHRConnection.PSHr'. 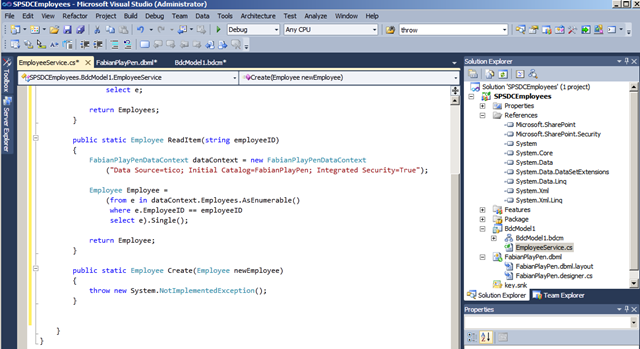 Ok, so how did you create your ECT, Web Service, .NET Assy? Id look there to make sure you have your Identity and Type Descriptors sorted out properly. If this is a Web Service, have you tried using like WCFTestUtility in VIsual Studio or create a web app to just test that it is working correctly? Often times if there is a problem in the Web SErvice you can quickly find it out there by executing methods in the tester utility. Pending that, and this could be an odd ball one, check to make sure you are not returning more than 2000 records in your Get List, if you are, then create another get list method and apply a filter to it and set that one as the default method.